Our local Branch of 23 members is part of Hereford Diocese MU, of 1000 members, which is linked through “The Wave of Prayer” with MU members in Damaturu in Nigeria, Lui in Sudan, Makamba in Burundi, Mara in Tanzania and the Women’s’ Christian Fellowship of North India. There is also a link with St Mark’s Theological College in Dar es Salaam for which we make stoles for the ordinands. Members in Hereford Diocese support the overseas work of the Mothers’ Union with prayer and providing financial support to the Overseas Fund and the Relief Fund. In particular we support the Literacy & Development programmes enabling many in the third world to read, write and become numerate. It is said that if you educate a woman you educate a family. The MU also runs Parenting Courses in this country and overseas. The Away from it All Holiday Scheme provides much-needed holidays for those who would not otherwise be able to have a holiday. The Diocesan branches meet 3 or 4 times a year to hear about MU activities in the Diocese and all over the world and for talks by national leaders of the MU. There are Diocesan, Archdeaconry and Deanery Festivals, church services at which we parade our branch banners. 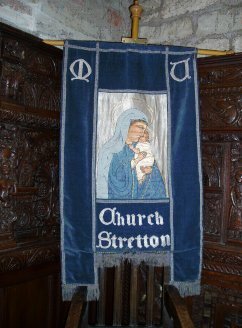 In Church Stretton our members take part in local projects and activities. Some members knit for needy children and make cot covers for the Women's Refuge. The branch provides lunch for young couples at their pre-marriage training day and gives them a prayer card and a candle on their wedding day. Some members help at the Parents and Toddler Club and annually we provide toiletry articles and dry and tinned food for the Women’s Refuge. Our regular meetings are a general meeting on the 3rd Tuesday of the month, usually in The Owen Room, when we have a talk and/or discussions followed by refreshments and a Prayer Meeting on the 1st Tuesday of the month, usually at 8 Queens Court, Church Stretton, SY6 6BZ, when we pray for our members here and around the world. The support and fellowship the members provide for each other is important too. Prayer underpins all the work of the Mothers’ Union. The rhythm of daily prayer and thanksgiving unites every member sharing compassion, commitment and dependence on God’s grace. For details of the Church Stretton Branch contact Diana Coles or Jenny Heath via the church office - 01694 724224. For more details about the Mothers Union worldwide click here or on the logo at the top of this page.